Rubbish clearance is much more complicated task than most people realised. There a number of hazards in getting rid of old furniture or electrical appliances. And it is usually not before you start clearing out your garage/attic that you come to realise that this is simply too much work for a single person, especially one that lacks professional training. Fortunately for several years now we have provided the residents of Kensington with junk removal services that are fast, affordable and environmentally safe. But what are these hidden risks? A lot of time people just stockpile useless items in their garage or attic because they postpone dealing with them. We’re talking about heavy and difficult to move items like old stoves, big 90’s TV’s, washing. It’s not difficult to imagine hurting yourself why carrying something like this – there are a number of ways to get hurt. This is especially true for people who attempt to lift an entire washing machine by themselves. If you arrange for a professional junk removal in Kensington you’ll avoid all these problems. No strained muscles, no twisted ankles. You’ll be amazed how faster the work goes when a professional rubbish removal specialists is handling the task. To ensure that everything will go smoothly with the jobs we’re hired to do we’ve assembled probable the best junk removal team in Kensington. Highly trained and highly motivated our clearance specialists are the right people to handle any waste collection. They’ll come pick up any rubbish you want to get rid of and have it delivered to the nearest waste disposal site or recycling centre should there be reusable materials in the garbage. Also we can offer you the lowest prices in the borough. Our waste removals are affordable for anybody. And we always customise the prices according to each customer’s project. Price is generally calculated by volume, however we will calculate by weight in certain extreme cases. Also we offer midweek discounts as well as such for very small jobs. To find out more you can call the number listed on our website or sending us an email. Those of you who’d like to initiate an order directly can use the booking form to the left. We make sure that you have a quote within the next 48 hours. Lease not that while we do not have any hidden fees and the quotes are as accurate as possible, we cannot include parking fee – these are due after the completion of the job. Get cheap and affordable junk removal assistance in Kensington from our company. We have an experienced group of cleaners ready to attack any waste collection challenge you might have. We specialise even in commercial garbage disposal as we have advanced machinery and the required technical capacity. Our deals are affordable and you can always get further discounts if you opt to hire us repeatedly. Call whenever you want for more information on our waste removal in SW7 help. We maintain a large selection of garbage collection services, which is why we are certain that we can cover all your needs. To us it does not matter whether you are facing an after builder’s junk removal in Kensington, SW7, or a landscaping waste clearance because we have the permits to dispose of any type of rubbish with the exception of chemical, toxic and hazardous garbage. The scale of your junk removal will not be a problem, as we have the needed technical capacity and human resources to carry out promptly and correctly laborious jobs. Our Kensington, SW7, junk removal services are fully insured. This way, our clients can have the peace of mind that they will be reimbursed properly in the case of an unwanted event. However, you should note that to date we have never activated our insurance policy, as we have never had any accident of any kind due to the fact that we always operate with utter diligence and attention to details. 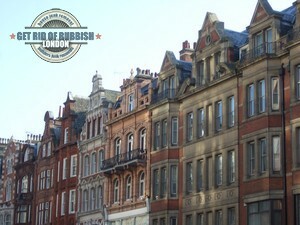 After all, it is not by chance that we are credited to be the most capable rubbish removal specialists in SW7. Aside of providing high quality and comprehensive junk removal services in Kensington, we also offer affordable skip hire options. Our bins are licensed by the local authorities and range from extra small to extra-large. If you desire, we can fit your skip with a locked cover in order to keep animals and pests out of your garbage. You can combine our garbage collection services with our skip hire options and benefit from a discount. Kensington is one of the two districts the borough of Kensington and Chelsea is named after. The origin of the name is Anglo-Saxon and probably means “The land of Kenesigne”. An interesting fact about Kensington is that it is the most densely populated local government district in the entire United Kingdom. Kensington is a district located in the Royal Borough of Kensington and Chelsea. One of the most spectacular places here is called Kensington Gardens which you can visit and enjoy since it is a public park with gorgeous Italian and Dutch gardens. Another highly populated place is Kensington High Street. It is a major commercial centre and museum district with some outstanding buildings such as the Royal Albert Hall and Royal College of Music. The Serpentine Gallery is one of the most famous exhibition venues in Kensington and London. The gallery was opened in 1970 and is houses in a former tea pavilion, which was designed by James Grey West and built during the first half of the 1930s. The edifice is classified as a Grade II building while the venue is visited by over 700.000 people on an annual basis.